Every time I make this bruschetta mix for family or friends it’s a hit. The recipe originally came from my mum who assures me that the secret is adding the teaspoon of honey which balances the flavours and helps to cut through the acidity. A good balsamic vinegar and extra virgin olive oil will also give you the best results. This recipe is about simple quality ingredients. In a bowl mix balsamic, garlic, and honey together. Add chopped, deseeded tomatoes and coat in the balsamic mix. Add remaining ingredients: olive oil, Spanish onion, basil and salt and pepper to taste. 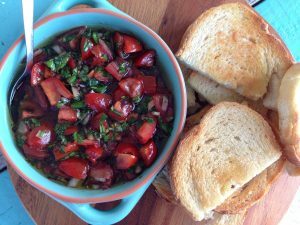 Serve with grilled or toasted bread such as ciabatta. Try with some fresh mozzarella or baby bocconcini thrown in. Enjoy traditional tomato and basil bruschetta on the day you make it for best flavour. The tomato will begin to go soggy after a day or so. Balsamic vinegar is graded using leaves. The more leaves, the better the quality. Four leaves indicate a slightly sweet, syrupy and full flavoured balsamic. Use more tomatoes if you prefer a milder bruschetta.